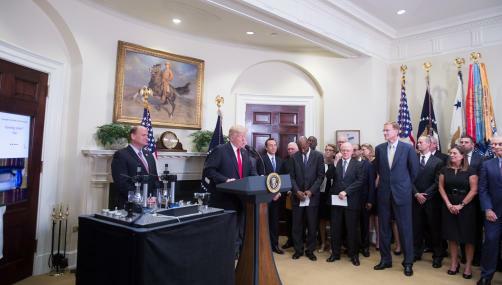 In a press conference at the White House, President Trump, alongside representatives from Corning, MSD and Pfizer, announced that 1,000 jobs would be created in a new pharmaceutical glass packaging initiative. It comes as part of Trump’s ‘Made in America Week’, to highlight manufacturing that is done within the US and potentially to deflect attention from the calamitous failure of his attempt to repeal the Affordable Care Act. The deal centres on a new form of glass packaging for injectable drugs in vials and cartridges. As demonstrated by a determined Trump, when encouraged to try break the product, the glass is able to withstand a large amount of pressure. The press conference featured a standard industry vial in a vice-like device that Trump was able to easily break with little force. He was then invited to attempt the same with the newly designed product, and, despite applying 1,000 pounds of pressure, was unable to damage the product. More importantly to the administration, the company behind the product, Corning, has pledged to create 1,000 US jobs in the short-term and to invest $500 million in the manufacture of the product. Beyond this, it has also stated that it will create a total 4,000 high-tech jobs and invest to the sum of $4 billion. The manufacturing roles will be based in New York, New Jersey, and a further site in the southeast of the US that is yet to be announced. The announcement was trumpeted as heralding a shift, with more companies and employment being brought back into the US. "Every day, we are fighting to bring back our jobs, to restore our industry, and to put America first," commented President Trump at the event. Corning had suggested that Trump and his administration’s efforts had been important in finalising the project within the US.